Winter squash is ready to pick when the stem begins to shrivel. Press the rind with your fingernail, it should resist denting. Pick before the first hard frost and cure by letting it lie in the sun for at least 3 days, turning it each day. Store in a cool, dry place. It will keep for up to 5 months. Chlorosis is usually caused by a lack of iron in the soil. With a mild case, the veins remain green and as it becomes more severe will turn completely yellow. Treat the soil with iron chelate according the package directions. As your young trees grow bigger and stronger, remove supporting stakes or loosen the straps as early as possible. Some movement of the tree is important to make it healthier in the long run. If the tree is able to stand on its own, it will develop a thicker trunk with a taper at the bottom. September is still a warm month in Santa Clara County. Continue watering established trees and shrubs until temperatures cool down. As a rule of thumb, trees should have a couple of deep waterings during the summer, if you haven't done that, now is a good time. Use a soaker hose or drip hose around the drip line of the tree and slowly water for two to three hours. Mature fruit trees need a bit more, fill the surrounding basin every 3-4 weeks, young fruit trees need water every couple of weeks. 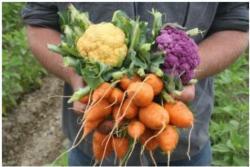 Many cool season vegetables can be planted in our Bay Area gardens in September. These include beets, radishes, peas, spinach, broccoli, cabbage, and bok choy. During our winters, nature helps with the watering, there are fewer weeds and pests, and harvesting can be done at a relaxed pace to due natural refrigeration. Check out our recommended times to plant vegetables in Santa Clara County and keep an eye out for our Fall Garden Market plant sales. If you have a light fluffy soil, perhaps in a raised bed, you can grow those long beautiful carrots you see in the grocery store. However most of us have a heavy clay soil and it is best to grow the shorter varieties. 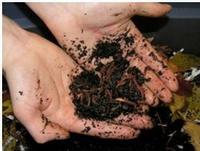 Adding organic material such as compost rather than manure is good. The seeds are very tiny and mixing sand with them will help you not over-seed. Plant no more than 1/2 inch deep. 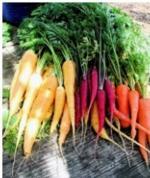 Carrots are slow to germinate and could take as long as 3 weeks. Keep the soil moist until they're up. Thin to 2 or 3 inches apart. Plant every few weeks for a continuous crop. If you have limited space, try growing in among your ornamentals, their feathery tops can look quite pretty. They can also be grown in a container. Some common problems are twisted roots from planting too close together, forked or deformed roots from clods and rocks in the soil, hairy root from too much nitrogen and splitting from too much water. 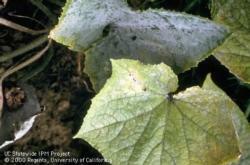 Mosaic virus on squash and cucumber plants is a disease spread by aphids and cucumber beetles. 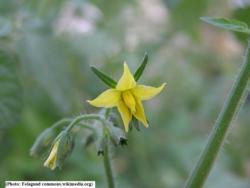 The leaves become rough and mottled, the plant becomes stunted and the fruit can be whitish. Pull the plant and put it in the trash. Do not compost. For more information see UC Pest Note on Squash Mosaic Virus. Neem oil is an approved pesticide in California for use on ornamental and food plants. It is derived from the neem tree. Aphids, caterpillars, loopers, mealy bugs, thrips, whiteflies, and diseases like mildew and rust are effectively controlled. It is most effective when alternated with insecticidal soap or pyrethrum, killing problem insects in different stages of development. Follow label instructions. Spray 2 or 3 times from 7 to 10 days apart. As with all horticultural oils, do not spray if daytime temperatures will exceed 90°F. Do your rose bush leaves have smooth round holes in them? The likely culprit is the female leafcutter bee. The bee cuts smooth round or oval leaf fragments and uses them to line each underground brood cell that she fills with nectar and pollen. When the cell is ready, a single egg is sealed inside. The larva pupates (matures) in the chamber and emerges in the spring. Rose leaves seem to be their favorite. The hole in the leaf is much larger than an ordinary caterpillar would make and is very smooth as if a miniature cookie cutter was used. The bee can chew off a leaf fragment in less then a minute with its sharp jaws. Like all bees, leafcutter bees are important pollinators and should not be killed.